The lack of touchdowns by Kansas City Chiefs’ wide receivers represents both a chicken and egg argument, as well as the beating of a dead horse. The easy joke is not always the most humorous one. Pointing out that Dwayne Bowe did not reach the end zone last season does not provide us with any new information about his play, or what he may have left. At some point, its best for us to move past the fact that Dwayne Bowe did not make it into the end zone in 2014, and focus on what he can do going forward. It’s easy to forget that Bowe was once one of the better wide receivers in the game. He scored 15 touchdowns in 2010, and consistently recorded between 70 and 90 catches, when he played a full season. Of course, that was all before Alex Smith became the starting quarterback in Kansas City, after the organization traded for him. This also coincided with Bowe signing a big contract, which led some to question his motivation and effort. However, since Smith arrived, Bowe has seen his production suffer a steep dip. This all culminated in his release soon after the start of the 2015 league year. The former Pro Bowler was not on the market for long. The wide receiver starved Cleveland Browns signed Dwayne Bowe to a new contract this week. It would seem he instantly vaults the likes of Andrew Hawkins and Brian Hartline as the best receiver on the roster. Unless another major move is coming, it looks like for better or worse, Bowe will lead the Browns’ passing attack in 2015. Being the top dog in a lackluster passing attack sounds all too similar to the role Bowe failed to shine in with the Chiefs over the last two seasons. Which brings us back to the chicken and the egg discussion. Reception Perception can give us a glimpse into whether Bowe was hampered by his offense and quarterback, or if he’s closer to finished than the former star of the past. 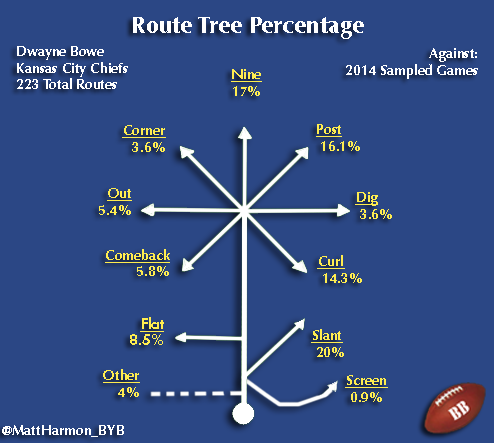 Talk about easy throws; 54.9% of the routes charted from Dwayne Bowe’s eight-game sample were in-breaking patterns. Combined with another 17% being nine routes, and you see this player was barely asked to run outside the numbers. Slants and other routes that go to the middle of the field provide easy, and risk averse throws for a quarterback. Due to Alex Smith’s limitations, and Andy Reid’s preferred offensive system, these sorts of passes were prevalent in Kansas City. 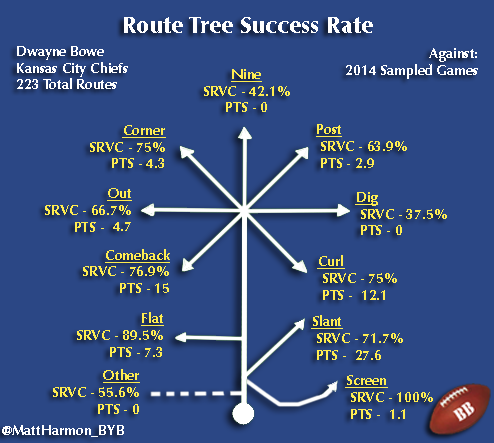 As it was his most frequently run route, it no surprise that Dwayne Bowe recorded most of is PTS on slants. However, while he had a solid 71.7% SRVC on slant routes, you would have liked to see that figure be a bit higher. Perhaps Bowe was not such a great fit for a quick hitting, timing based offense that Alex Smith likes to run. call for a receiver to box out a defender. Bowe posted a contested catch conversion rate of 70.6% over his eight-game sample, which was above average. He is still very good playing the ball in the air, and using his body to shield defenders. Bowe can certainly use these skills on comeback and curl routes, and succeeding on post routes requires a receiver to find the middle ground between the defender and the ball. Bowe’s SRVC against man was among the lowest charted for a starting NFL receiver, at a paltry 52.6%. Never the fastest player, its apparent that there is even less speed in this player’s legs than during previous seasons. Clearly, hoping Bowe is going to win a vast majority of his one-on-one coverage reps is foolish. This must now be considered a weakness in his game. However, his consistent success in contested situations does mitigate some of that worry. In regards to wide receiver play, it’s all about complimentary skills to cover other weaknesses. While Bowe isn’t going to win consistently against strong cover corners, he does have the size and strength to win the ball in tight coverage. If one aspect of Bowe’s game improved during the Andy Reid/Alex Smith era in Kansas City, it’s his ability to find holes in zones. His SRVC of 83% is on the high-end in relation to his NFL peers. Bowe has developed as a route runner, especially on combination routes, to find soft spots in zone coverage underneath. Bowe’s game in the Chiefs victory over the Patriots early in the season stood out for his play against zone coverage. He confidently worked open, against good corners, to create easy throws for his quarterback. While the Cleveland Browns did not sign a surefire number-one receiver when they inked Dwayne Bowe, they acquired a player who can certainly help them. His Reception Perception data, while not flawless, quantifies some of the anecdotal analysis of his poor fit with his old team and quarterback. Cleveland’s situation behind center is unstable, and more tenuous than Kansas City’s, but some of their options may actually help Dwayne Bowe post better numbers. He’s not the type of player who can be thrown open on underneath patterns. Rather, he needs to be trusted to win 50-50 balls on routes where he snaps back to the quarterback. The Browns would be wise to consider adding another receiver in the NFL Draft, especially a vertical threat. Bowe’s lack luster SRVC scores in man coverage and on nine-routes speak to his lack of ability in that sector of the game. He will play more of an Anquan Boldin-lite role for the Cleveland quarterbacks. There is nothing wrong with that, and that’s a player this team desperately needs. Should Cleveland add a talented young wideout in the draft, a receiving corps of a rookie, Bowe and Andrew Hawkins is a solid start to building a passing game. While the signing came with some questions, bringing Dwayne Bowe into the fold was a fine move for the Cleveland Browns. Are you interested in learning more about Reception Perception, and seeing more players’ data? Be sure to become familiar with the upcoming publication, and follow the #ReceptionPerception hashtag on Twitter to keep up with all future featured receivers (including draft prospects).